So word on the Street is that people today would rather be electrocuted than spend 15 minutes alone with their own thoughts! I don’t know whether to laugh or cry at this bizarre yet clearly Orwellian statement. Ok. So for many people today, thoughts, represent pain. Pain that is so excruciating, that jolts of electricity, pulsating through one’s body, would be preferable. WOW! and WOW! This article on Drudge, HuffPo, and CNN, states that ” people would rather inflict pain on themselves than spend 15 minutes in a room with nothing to do but think” Yea. REALLY? The crazy thing is that I believe it. Or perhaps it’ s not crazy, but rather it’s the “New Normal”. Because the truth of the matter is, that the overload of info people have aiming at, and penetrating their brain today, is a laser beam of intense distracting and detracting sensory stimulation. That even the mere idea, of alone time with that thing called “thoughts” is a weird concept, like out of a fairy tale from the 1970’s and before, you know when people actually HAD to think or they were really screwed! Thinking and doing were synonymous with producing anything of value. The empty-headed non – thinker was perceived to be either stupid or mentally deficient. Well, that’s all over. For example- when I recall the process I would have to go through as a student at NYU, now one of the most expensive colleges in NYC, to research and write an essay for assignment in one of my journalism classes, I feel like I must have been an inhabitant of the Paleolithic cave era, compared to the easy breezy, lazy, sit back and relax methods, students today employ, to smash those college exams, and fulfill their course work. It’s the push- a – button methodology. Then kick back, peruse the screen, while sipping your choice beverage, or, and smoking your choice weed. “Do a little dance, Make a little love, Get down tonight” as the song goes. Point is, that the kids are on a track. It’s the distract track to getting it done, making it stick, accomplishing a goal, success seeking, project completing, job achieving, but in Real Time, isn’t the penultimate obsession today making MONEY? It is no longer the dirty little secret people avoided talking about, because how shallow, how banal, how bourgeois, let’s face it how embarrassing! Not Anymore! Comedienne, Wanda Sykes says “I said it!” Thank you Wanda! Because today people aren’t afraid to admit it, scream it to the winds, and embrace the sordid shallow fact of the New existence “1984”-esque style. Are you kidding me? Today, this concept is an anomaly. Because one must be plugged in. Not to the real brain, but to the faux brain, ie. the machine. Technology, baby! That’s where it’s at! I am not about to go into my personal M.O. On this subject because I held off for let’s just say forever and a day until I woke up, one day and realized that I was doomed to either become a hermit and have no contact with the world as Huxley describes it in “1984”, or be one of those Oldie Goldie freakazoids who walks around gloating over the fact that they are computer illiterate like some kind of insane claim to fame, while people are thinking oh right you are really just either stupid or senile but Mostly you are freaking OLD! So, it’s called ” get with the program.” Get hooked up. Don’t have to like it. Don’t have to want it. Just do it, because. It’s a fact, that we are all living in an age of Assange melodrama, hookups, wired, electronically programmed and media mesmerized psyches. It just makes the pain so much easier, so tear that bandaid off as fast as you can! I mean get real, it’s obvious to anyone who is an observer as am I, of human nature, that artist types hate to follow the crowd. The idea of self identification as sheeple is pretty damn insulting, and as Thoreau says, “follow the beat of a different drum”, except, what IS the beat? Is your beat my beat? Nooooooo. Like why is everyone all worked up over Kanye’s rants? Is this really disturbing to you that he actually has an opinion, takes the stage and let’s loose? 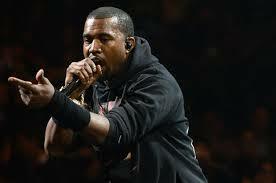 I mean, I am no fan of his music, really, not my speed, but ok, he clearly is on a venting mission, saturating the public with his thoughts while engaging the media simultaneously. Oh WOW, he thinks? He thinks in surround sound, Bose Sound Amped. 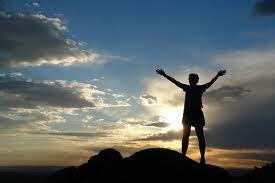 It’s Verrry spectacular in its negative attention, creating dual intention, both of which he achieves. Game On! Mission Accomplished! And he certainly gets a lot of multi purpose attitude from the masses, consumers, aka The Public. Oh he is on his game, no doubt because hey if we are talking about him he’s relevant! It’s only when we STOP talking that as a celebrity, he has a problem! People fled the theatre in London, why? Oh yeah, forgot, Kanye’s thoughts exposed were soooo painful! But then, nothing is worse that the silent arena of your own thoughts! Remember? Or is it just thoughts in general? The “Thought Police” in “1984” certainly believed it. 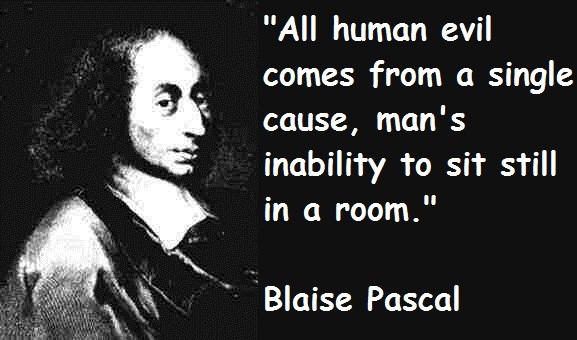 Pascal also said that “Man’s greatness lies in his power of thought.” Power and Thought have always been synonymous, as the defining link capable, of either destruction or creation. But that was before we became wired up, to mechanics, designed to get into our heads and force feed us ideas and thoughts that don’t belong to us while also keeping us on a constant entertainment, news, media hype, 24/7. After all, if you aren’t plugged in, you might miss something: a text, a call, a news story, an e mail, a movie, a you tube joke, a health scare, disaster, tragedy, and the list goes on and on and on. Well, apparently the man knew from where he spoke. And that was a long time ago. Because today, according to the article. Thinking is painful. I get it. The mass consumption of prescription medication, the pharmaceutical companies, pushing this poison on people, has numbed them out, dumbed them down, and literally suffocated their spirit. Now, from the i-phone, to the PC, to the plugged in tunes, to the supersized flat screen, and ring around the proverbial Rosie, again and again, the rat’s maze of uber technology. Life as we know it today. It’s an ultimate buzz kill because guess what?, dependence on electronics can be like being locked in the ShawShank prison,of technological dependence, with the main concern being, can I pay that Verizon, or Time Warner, Optimum, Vios, because you know all this stuff adds up! Or you take the chance of getting turned off, shut down, and subjected to the pain your intruding and excruciating thought will inevitably cause. The torture chamber of the mind. Your mind. So, artists are kind of in a quandary. 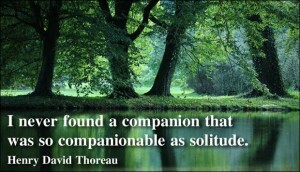 because we need to be alone with our thoughts, Right? Ever heard of a painter who sat in front of his canvas with an audience cheering him on? Or a writer at work surrounded by crowds of adoring fans, waiting desperately for him to come up with his next clever phrase, or for the poet to deliver that perfect symbiotic one liner? hahaha. It’s absurd. It doesn’t happen. It’s a myth. It’s not real, Ginsberg wrote his classic HOWL from the depths of soulful angst, past misery, futuristic visions, and present fantastic dreams. An I phone, a computer, a tv, wasn’t involved. 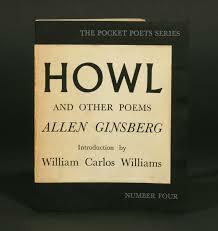 Just Ginsberg and his wild creative, original thoughts! Can I mention something interesting Picasso said? Look, Orwell, said it redundantly in his epic, 1984. The source of creative ideas, thoughts, not the distraction of things, and definitely not when technology monopolizes the individual, to the extent that sitting alone and thinking feels like punishment. “If you want a picture of the future, imagine a boot stamping on a human face forever.” I interpret this to mean that Orwell is predicting the decline of humanity. 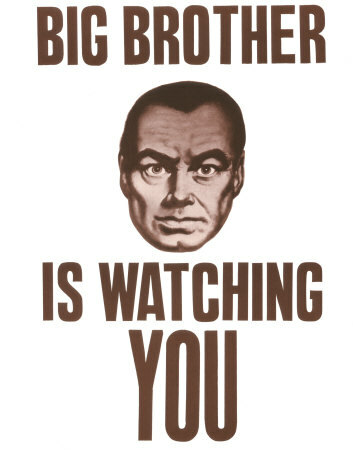 He also coins the phrase “Big Brother is Watching You”. Fast forward those words to the present. We are being watched. NOW. And everybody knows it. When Orwell wrote “1984”, in the year 1949, he was spinning an imaginative fiction from the guts of his own creative minefield. This was his fictional prophecy based on a combination of fantasy and fact. The reality and truth of his otherworld view as I see it from the view of today’s life is astounding in the intellectual capacity he used to develop his creative storytelling, and actually take us on a futuristic journey into a new reality. The Matrix, becomes the mini reality of “flatlands” where the 2 dimensional universe appears to be real, when actually it’s only an illusion. 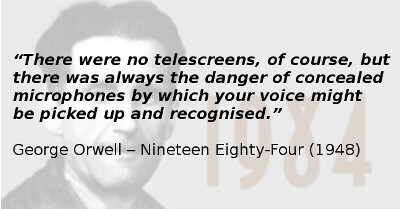 Orwell, makes sure we know that 1984 is the New Real. Describing, “double think is how we communicate ” Here, nothing is straight forward. Truth is only a word. There is always 2 sides, and no one is allowed to possess Truth, because it is a counterfeit, an ongoing experiment with no conclusive answer. 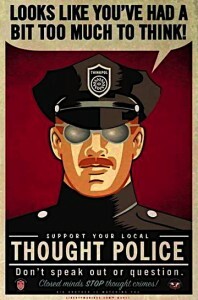 And if you aren’t careful the Thought Police will get you! Sound familiar? Eerily like today. In 1984 one of the ways, the people were programmed was by the use of posters. They were everywhere, to constantly remind people, what was up! The Power of the Poster! Today the media has that kind of power! Invasive, inescapable, hypnotic! 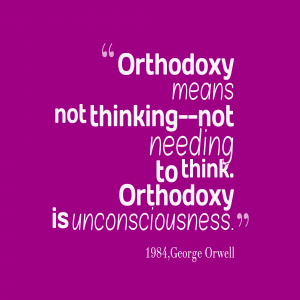 So, yes, Orwell predicted this new reality, the one described in the recent Us News Report, that electrocution, zapping, with lasers, stun guns, is for most people preferable to thinking, solo, like Thoreau at Walden Pond, for him pure ecstasy, but, that was a long time ago. Ancient history. Long before the “thought police”, disguised as computers, in their various forms, took over people’s minds, and stripped them of their art, their creativity, and any modicum of individuality they might have possessed! So, the next time you are in a gallery, or have a work of art before you, or pick up a book, or start arguing with your buddy about the words of that Ginsberg poem that makes no sense, ask yourself is this coming from ME? Or is these merely messages superimposed unto my mind through my constant hookup to the machines that I am communicating with all day, everyday? 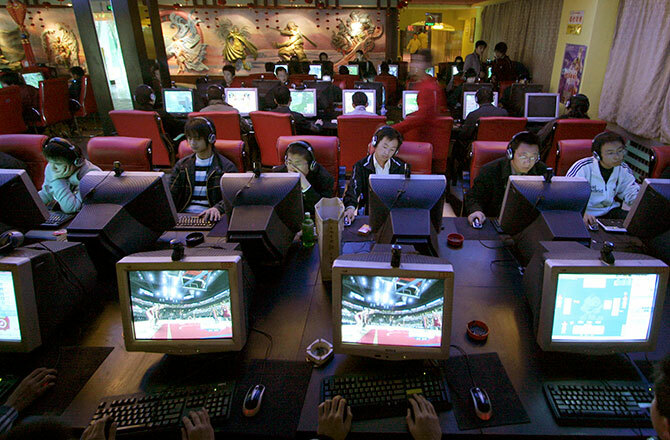 Am I hooked up to the distraction traction of Orwell’s fantasy? Is this the media or me? Is this Big Brother dictating? Is thinking becoming a painful undesirable activity, as the experiment documented??? ?